Ever since coming across this DIY on Design Mom, I’ve been waiting for just the right opportunity to do some major marbling. 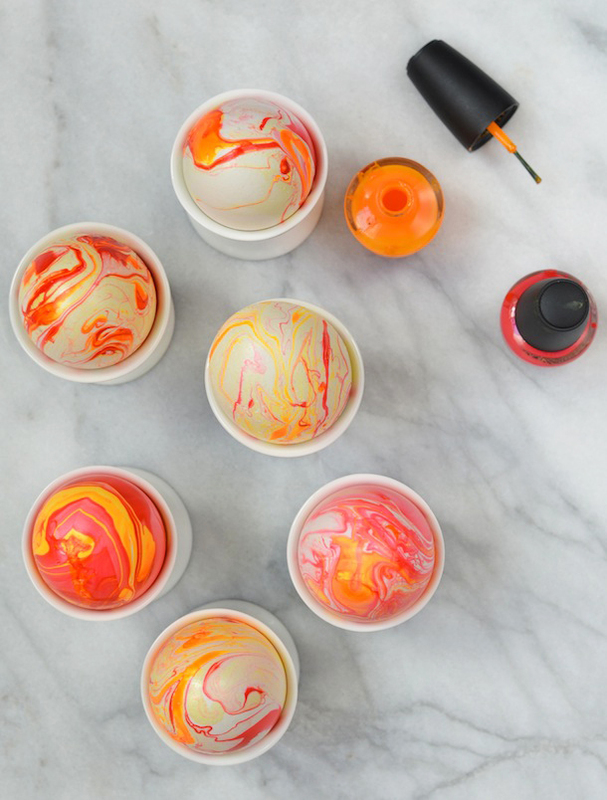 When I sat down to brainstorm projects for the upcoming Easter holiday, I thought about how the vivid shades of nail polish would be perfect for marbling Easter eggs… and didn’t they turn out pretty? Making these is rather addictive: I couldn’t stop playing around with different color combinations and dipping just about everything in sight into the swirly waters. But the most fun part was seeing how each egg turned out completely different. Keep reading to see how it’s done! Pour a few drops of each nail polish color onto the water surface. Be sure to experiment with the step as the order you pour the colors results in varying marbleization. Use a stick to swirl nail polish around. Carefully submerge the drained egg into the water until completely covered, then quickly pull out. Set egg aside to dry. Scoop out nail polish from water surface between eggs, and repeat steps 1-4 for each. tip: create an egg drying rack like the one pictured by poking t-pins through a thick foam board, about 1.5-inches apart. I’m in LOOOOOVE with this idea! No stinky vinegar involved! Riiiiiight?! Vinegar is the worst part of Easter. Just use piggy paint 🙂 no smell and non toxic so kids can help! Yes, What is piggy paint and can you use it on hardboiled eggs that we would eat later? Hi…I just wanted to mention that piggy paint, although claiming to be safe for use while pregnant, contains neem oil. It can cause infertility, harm a man’s sperm count, and can even cause miscarriage. It can be unsafe for children, pregnant women (or women trying to become pregnant), people with multiple sclerosis, lupus, rheumatoid arthritis, or diabetes…just to name a few. While I realize most of the danger comes from ingesting neem oil, I can easily picture a small child picking up a bottle and wanting to see what it tastes like. Serious side effects in infants and small children can happen within hours after taking neem oil. These serious side effects include vomiting, diarrhea, drowsiness, blood disorders, seizures, loss of consciousness, coma, brain disorders, and death. Maybe it’s not as safe as they claim…. So cute!!! Is it ok to eat the eggs after doing this? Thanks so much! This version was actually made with eggs that had the yolk + whites drained out of the bottom, so they were just the hollow shell. I think I’d be wary to eat an egg that was dipped in nail polish, but you may have some luck googling to find the correct answer! So brilliant! I am dying to try these. WOW! I can’t wait to try this! These will make a lovely hostess gift as we are traveling to be with family this Easter. Thanks so much for sharing the tutorial! Gorgeous!! I did this at christmas time with ornaments, but used spraypaint instead. I love this idea with nail polish! Your projects always amaze, Camille! Oooh, I bet the marbleized ornaments were gorgeous! What a pretty idea. SO beautiful! this is my favorite egg design I have seen yet 🙂 thanks for sharing! Wow, awesome idea – so clever to think of using nail polish! I think I’m going to try this with my 3 year old daughter with her favorite shades of pink, hot pink and purple! What a fantastic idea! Very creative and unique. I would love to do this but with blue, purple and green. Can’t wait to give it a try. This is amazing and so gorgeous! I am definitely tackling marbling eggs next Saturday. nail polish! what a great idea! That is a nice easter DIY. Love it. Putting one at every place setting, gorgeous idea–love it! They look absolutely gorgeous. Love the idea. I am going to make this with my family. They turned out gorgeous! Such a fun idea and so sweet at each place setting. Yum – perfect way to use those eggs up! Am going to be trying this tonight! Drained the eggs this morning (which I bet is the hardest part!) Can’t wait to see how they turn out! does the water have to be hot or cold when putting eggs in? Cold to room temperature is best! cant wait to try these out they look soo awesome!!!!!!! love love love love these! so simple, so pretty, so perfect. should water be cold or hot ? is there any special tip? Very beautiful! Do you eat these afterwards?? Seems very unsafe…. Supposedly nail Polish is harmful to your bodies when just applied on your nails. Dumb??? I don’t know how to get the egg out of the shell. I would love to do these with my grand children. Will someone please help me? To drain the egg (which I never bother to do) you poke a pin hole in each end of the egg and gently blow out the innards. If you wish to keep your decorated egg, this would be necessary. Since we just throw out the eggs after a week or so, I don’t bother with this step. You can also use acrylic paint for the marbling, but you must swirl it quickly because it thins with water. I hope to try these with my grandchildren next week…… except we will cooked eggs in the same manner that the Amana Colonies do when they color theirs with furniture glue & dye. The egg dries after time leaving a yolk type feeling to the egg if you shake it. I’ve had my Amana eggs for many years and have held up well, except to the little inquisitive fingers of grandchildren. Glitter nail polish would look awesome on these! FYI – I blew the eggs and froze them. For regular baking and cooking, just defrost them. Wonder if you could use wood eggs painted white then dry over night with this? Actually, the eggs on the photos are only shells with a hole on the bottom so the person can hold them. I’ve just tried with eggs that were just boiled and it’s pretty difficult but I am not sure it they have become unsafe for eating now. This was not very successful for us. As soon as we tried swirling the nail polish, it globbed all up and gathered on the toothpick in a clump. At first I thought it was because I was using old nail polish. So I went out and bought more. Same result. Did anyone else have problems with this method? It looks great but what about any toxins from the polish leaching into the eggs…? I think I’d try this with hollow eggs (though not sure how you’d get them to sink below the surface of the water…?). I tried this and it did not turn out good at all. All the nail polish stuck to the stick and it was so hard to not touch the nail polish on the egg. Hoe are you supposed to set it down without it getting messed up? Sorry to hear that, Lola! I didn’t have any of the problems you listed above, but maybe try swirling with the stick more gently, and using just the tip of the stick? Once you set the egg down to dry, a little bit of the polish might get messed up, but it should still look pretty good! I found some white wooden eggs at Hobby Lobby and I plan on drilling holes on one end and adding a small eyelet screw. This will help keep the polish off my hands and with string through the eyelets used for dipping I can also use fro hanging to dry.. I’ll let you know how the whole process turns out. One good thing is. I canhopefully uses the eggs for years to come and add new colors to them if need be to match my decor. Looking forward to this fun project. Is this safe to eat the eggs after? I think I might have used too much polish. A few drops didn’t look like enough. Do you know about how many drops you used? I used plastic eggs. This does not work. I tried 18 eggs. The polish does not marble. It sticky and in strings or blobs of polish which I pulled off to pushed onto egg. I did try add polish remover and it did work better. I ran out of polish by then. The best marble coloring use to be sold in little rabbit bottles with rabbit ears stoppers. I have tried many ways and tried to find that old Easter egg dye kit but nothing compares to that old Rabbit Easter egg Kit.